The finish of the race is never the end of the day. Believe it or not, I not only need to keep walking, but usually spend an hour or more at the finish area. Standing up. And, we walked almost a mile back to the hotel! I am so grateful that Ace and Sunshine were there as soon as I walked through the finish area to pick up my medal, my tee, my hat, my aluminum foil cape and get my picture. I'm pretty sure that Sunshine jumped the barrier before I crossed the line. I hugged her and kissed him and made my way out of the barricades. I got a hug from Boss and Yoga Spice and they took care of me - wrapped me in warm clothes, found me a port-a-potty and followed me to the food tent. The finish of the race is never the end of the experience. Hours later I remember what the lake tasted like, what the sun felt like on my shoulders on the bike, what the dirt tasted like in my gum on the run, what the finish chute sounded like. Days later, I am content and satisfied and wearing my medal everywhere I go. Weeks later I am giddy and proud and amazed (at even myself). A month away, I will dream of the hills or the peace at the swim start and I will relive my favorite parts of the day. I still dream of biking in France and running across the line with my two best friends - one in 2013 and one in 2016. I get lots of questions as I return from the MDOT bubble. Here are a few, plus the replies. WHAT DID YOU FEEL LIKE AFTERWARDS? Immediately after this race, my right shin was sore and both of my lifters (my hip flexors) were tender. But, I have never felt stronger after a race. I will say that I was I was too uncomfortable to get a good night's rest. My quads were puffy and sore to touch and my neck and shoulders hurt. And I was sunburnt. And chafed by the zipper of my tri top down the front of my body. And mini Wrunder Woman had scratched a hole in my spine from my back pocket. HOW MANY CALORIES DO YOU BURN? AND WHAT DO YOU EAT ALL DAY? My Garmin showed that I burned 6000 calories that day. I was in an aerobic heart rate zone most of the day and was probably on target. Once the race started, I ate: seven GU or CLIFF gels [Caramel Macchiato, Salted Caramel, Peanut Butter, Raspberry (which eaten together is a PB&J), Mocha, Vanilla and Root Beer), 400 calories worth of my Infinit Custom mix (named GUSTO GRAPE), three packs of CLIFF chomps (new Gingerale is AWESOME), two bananas, one packet of Justin's Vanilla Almond Butter, 1/4 cup of Cola Gummies, at least two Red Bulls and some cola. Me and Honey at the Iron Horse Vineyard. WHAT DO YOU EAT AFTERWARDS? I am always so hungry right after the race. I crave salt. Usually, I want a ChickFilA sandwich. This time, I filled my plate with delicious local pizza (which I gave to hubby), french fries, pulled pork tacos and two chicken sliders. I ate about 10 french fries and maybe an ounce of the chicken. And it took my 30 minutes just to get that down. The next day I was able to eat a full breakfast including scrambled eggs, potato wedges, a bowl of fruit, bacon and sausage. I also downed a whole bag of my new favorite chips. ARE YOU NAKED UNDER THE WETSUIT? No! I AM STRONG AND FAST. OUTRUN. OUTLAST. YOU ARE STRONGER THAN YOU BELIEVE. YOU HAVE GREATER POWER THAN YOU KNOW. I AM STRONG NOT FAST. I'm BUILT TO LAST. I AM MOANA OF MONTANUI. YOU WILL BOARD MY BOAT. MENTALLY TOUGH. FAST FEET. STRONG LEGS. SCOOP YOUR BELLY. TUCK YOUR TAIL. NO MORE RHYMES NOW. AND I MEAN IT. ANYBODY WANT A PEANUT? DO YOU GET THE IRONMAN BLUES? Yes, but not yet. I actually think this gets better each time. WHAT DOES THAT FEEL LIKE? I miss each race after it's over. I miss the experience and the challenge. I miss the training. I miss the interaction with other athletes. I feel relief - which wears its own sadness. I am relieved that I am safe. I am relieved that my body faced the test - and passed. That we traveled to and from a land Far Far Away. I am grateful. Which doesn't make me blue but does fill my heart to overflowing. I am grateful for my life. For my husband and his support and encouragement. For my friends who traveled 3000 miles. And for my friends and family and training buddies who cheered from home. I mentioned in a previous post that on the bike I had to avoid at all cost thinking about how far I had to go in the race. I caught myself in those hours after the race thinking about how far I'd come. One hundred and forty point six miles. In one day. It put me on the verge of being emotional in those days following but, it it has actually taken more than a week for it to finally hit me that I did an IRONMAN. Again. It's a feeling I want to hold on to. It's clarity and happiness and holy-cow-ness and power and love and joy. I want to feel that and put that out in the world. Because these days, we sure do need it. WHAT'S NEXT? HOW SOON DO YOU START THINKING ABOUT YOUR NEXT RACE? ARE YOU DONE YET? I am not done. I have already started thinking about next year. I have several ultra distance tris on my bucket list and I can't wait to get them on my calendar. Mt. Tremblant. Boulder. Copenhagen. These are the dreams of those who will never qualify for Kona. I am also not finished with 2017. But, I will save that for next time. Day After: Me, Boss, Honey and Sunshine at the Iron Horse. Day After the Day After. We turned on the fire pit at 9:00AM and sat in the sunshine. THIS IS GOING TO TAKE LONGER THAN I PREFER. Those were my words to Michelle as I passed my crazy crew at mile seven-ish - near the end of the first loop. I wasn't feeling so hot and the same feeling that I had had on the bike was chasing me on the run. I didn't want to do this loop two more times. It's too early to feel this way. It's hotter than I prefer. This gum has dirt in it. My first four miles had been great. I stuck to my plan of a four minute run + 30 second walk. But, somewhere on the out and back spur I made the mistake of worrying about the outcome. This was not going to be the run I wanted (4:45ish for my 45th triathlon), my friends were going to have to wait so long for me to finish. I was not going to finish in under 12 hours. Worry. Whining. Wimpy. Whipped. Walking. Not 4G philosophy. Not Wonder Woman words. I could barely hear the sound of my friends cheering for all the whining in my head. This was my mini Wrunder Woman. She was in my back pocket for the swim, bike and run. Here she is protecting my Emergency gels. But, as soon as the words left my mouth, I was able to let it go. I need a reset, I thought. I pulled out my mini Wrunder Woman (yeah, I spelled that right) and walked for two minutes. I danced through the BASE SALT energy tent (they were playing Lady Gaga -- loudly -- and dancing). I made my way up out of the greenway and into the fan zone: three blocks of spectators, plus special needs and an aid station. I was back on it and ready for loop two. I danced back through the BASE SALT zone (Gangam Style) and past my crew. Sunshine was screaming U2 lyrics at me, Ace was taking pictures and cheering and Boss & Jess high-fived me. I loved the run course. There were parts that were in the sun and parts that were packed gravel and the return lap is up a gradual hill. But most of it was paved and shaded. It followed Santa Rosa creek and felt far away from downtown. It was quiet and there were places I could hear the creek below and see the runners on the north side as they headed back in. I saw wild turkeys (including three minors), I spotted a musical performance of Much Ado About Nothing in the park and saw Mr. Push-It again. This time, he was wearing only a sign (or so he made it look with his bare chest and exposed legs). I think his sign said: IF YOU WALK, I DROP THE SIGN. As I passed with a group of women, he said: eyes up here, girls! Eyes up here! And pointed to his own eyes. I had been dreading the second loop but it actually flew by. I admit it: It may have been the Red Bull. I had waited until mile 8 to drink one and it was worth the wait. Plus, I liked ticking off the spots that I'd only have to see one more time. I only have to go up this ramp one more time. I only pass by this aid station one more time. I passed my crew, then the BASE salts [I wanna say DONTCHA by the Pussycat Dolls], then the fan zone, then the BASE salts [Baby, You're a FIREWORK], then my crew. They headed to the finish line and I finished up my last loop. This loop was even better. I could tick off every spot that I was going to see for the last time. I played leap frog with two other runners who were also run/walking. I made up six new mantras and repeated one for every four-minute run interval. I counted to 100 in French. I ran my secret goal pace (9:30/mile) for two of the four minute intervals and it did not feel great so I quit looking at my pace. I read the signs that my crew had written on the sidewalk: HI! WANNA BE FRIENDS? and IT'S NOT A HILL. IT'S A SUNFLOWER and 4G: GUSTO GUMPTION GRUEL & GRACE and UNC GIRLS ARE FAST. Hey, wait a minute! She is in pink, after all. I came up out of the greenway and was ready to finish. I knew not to start too early because it is about 1200 meters to the finish (three times around a track), but I picked up my cadence and tried to propel myself forward with a bit of a pick-up. I made it past the bike transition, around the changing tents and towards D-Street on the heels of two runners - one much older (he was 75) one younger (she was 26). Go Get that Finish, she cheered as I passed. C'mon, let's go! I shot back. I bolted up the finish chute which was so long - and not long enough. I started yelling my fool head off. YES! I shouted. I AM AN IRONMAN. I DID IT! I started prompting the people on the sidelines to cheer back - fists pumping, arms raised - WOOO HOO! I heard Ace and Jen cheer on my left and high-fived Michelle and Jess on the right. I practically jumped across the finish line, faced the cameras and did my best Wonder Woman pose. I mentioned in my swim post that I have a list for my pre-race routine. That bulleted list includes: ABC BIKE. It stands for AIR, BRAKE, CHAIN. I had completed that checklist on Friday when I handed off my bike to TriBike Transport. (They provided a bike shuttle service from downtown Santa Rosa to Transition 1 which I highly recommend.). On Saturday, I checked off my list: AIR, BRAKES, CALIBRATE. I did not check my chain. So, when I rolled out of T1 and hopped on at the mount line, my chain had jumped the track. Duh. Mentally, I could have freaked out. Mainly because my chain was already in my head. I had taken Lucinda to the bike mechanic on Thursday before the race and he had commented on my front derailleur and how worn-out my chain was. One woman near the bike exit caught my eye: are you okay? she asked. I'm great! This is perfect! I stopped, dismounted, quickly fixed it and off I went. THIS IS PERFECT was my mantra for the day. I had already written it on my bottle's wetsuit. I knew that no matter what happened it would be perfect for me: perfect timing, perfect lesson, perfect walk break, perfect scenery. You can use it sarcastically or with belief, but if you tell yourself THIS IS PERFECT for 140.6 miles - it is going to be perfect. Perfection has held me back, but if you believe that every moment is perfect for that moment then it can change your whole trajectory. 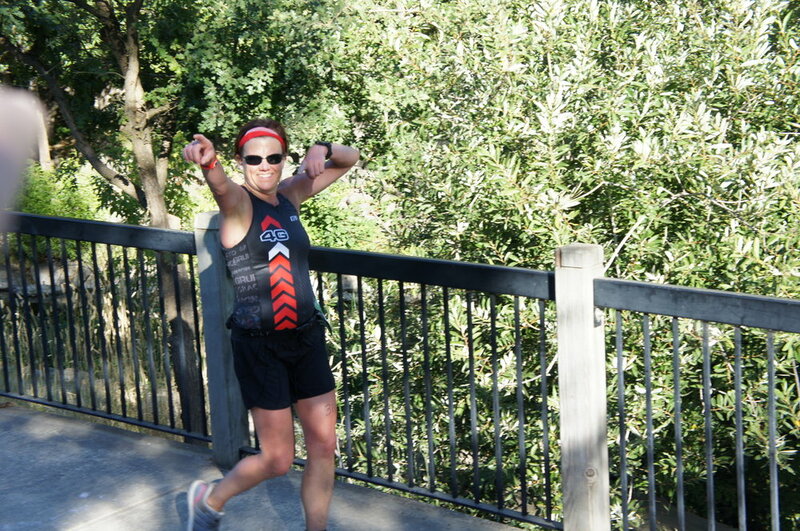 I loved the course coming out of Lake Sonoma into Cloverdale and south through the wine country. There was one hill that (as my friend and mentor Sami said) got my attention and took over ten minutes to climb, but otherwise the rollers were manageable and fun. In fact, I wished there were other hills like the big one. The best part of that long, first hill was a spectator K. Chang who had a boom box playing Salt'n'Pepa's PUSH IT on repeat. He had a sign and was yelling PUSH IT REAL GOOD! It would not be the last I saw of him. My goal for the first 30 miles was to go easy. Ridiculously easy. To keep it low: Watts low. Heart rate low. Yes, speed low. It is so freakin' hard to do. People are passing and I felt great and it feels like a net downhill. At mile 32ish I reached Spiceland! Ace Spice, Sunshine Spice and Boss Spice were waiting for me at the Fredson Road out-and-back. They had a pink raft as a sign that said GO BETH in glitter. They had chalked the road with inside jokes and 4G phrases. I rode down Fredson, hit the turn-around and headed back. I was able to see them again and flash them the 4G! My goal for the next 50 miles into town was to ride like a ninja. Ride the terrain like a pro. I had taken some tips from Endurance Nation and Matt Dixon in training and deployed those tactics on race day. I played leap frog with another athlete for 10 miles until finally passing him at the Wilson Winery. I hit 36 mph on one amazing down hill and took in the scenery - wineries, redwoods, horses, cows and birds. I had a low moment as I hit mile 65 at the 4-hour mark. It was the start of the double loop and I knew I'd have to see this point two more times. Plus, I wasn't even at the 80-mile mark yet. I felt whiny and hot and thought: this is dumb. I've got so far to go. But, I remembered the wise words of Matt Dixon: avoid at all cost the thought of how many more miles you have to go. I remembered that THIS IS PERFECT. This is exactly what is supposed to happen. And I know just what to do. So I stopped. At the next aid station I took a nature break, got sprayed with sunscreen, I ate a banana, I drank part of a very cold water and poured a lot of it on my head. I ate a Ginger Ale Clif chomp and had some BASE salts. I suddenly felt better. I got back on Lucinda and we headed into town. Right after that, I heard and then saw my peeps. It was a surprise and was the emotional boost I needed. I did not love the downtown loop of the course. There were a sh!tlotta turns, there was little shade and there was Irwin Road. There were 24 turns per loop! I liked the part through town because there were crowds and the turns and barricades made it feel like you were racing the end of a stage in the Tour de France. As we headed out of downtown, the shade disappeared and there was juuuuuuuuuust enough wind to make it feel like there was head wind the whole way. I did like that we rode for a second on the 101. And then, there was Irwin Road. Sami had warned me about Willowside Drive at mile 56ish and I'd survived it. But Irwin was something else. Potholes, gravel, rutted patches, grass in the cracks. It felt like cyclocross! On that first pass, my torpedo water system on my aerobars became unhitched at the velcro strap. [THIS IS PERFECT] I stopped and tightened it, but couldn't get my Garmin Edge to sit correctly on its mount. It was tilted forward so I couldn't see any of the data. I had my watch, but don't usually use it for the bike (eyes on the road, people). I was lucky that was all that went wrong. There were more tires and tubes, cages and bottles and nutrition than I've ever seen on the side of the road. My goal for those two loops was to feel strongest on the last one - and I did! I made a point to drink more water on this ride (close to 80 oz) and take in more salt and it worked. Plus, I saw my cheerleaders at mile 90 and that gave me another boost. Knowing that I had only one loop to go was exciting - because then I get to run. [Wait. What?] That last loop wasn't any faster than the other but I felt great. I was positive and happy. I finished in 6:50:23. It wasn't a personal best, but I knew I'd set myself up for a solid run. The day started at 3:00am. I took my meds [more on this to come], prepped a spot of tea and checked and rechecked my gear bags. At 3:40, Ace and I headed to T2 to meet Sunshine, drop my gear bags and hop on the bus. I ate as I walked. My team scoping out the swim start the day before the race. My team had debated for days about going to the swim start. 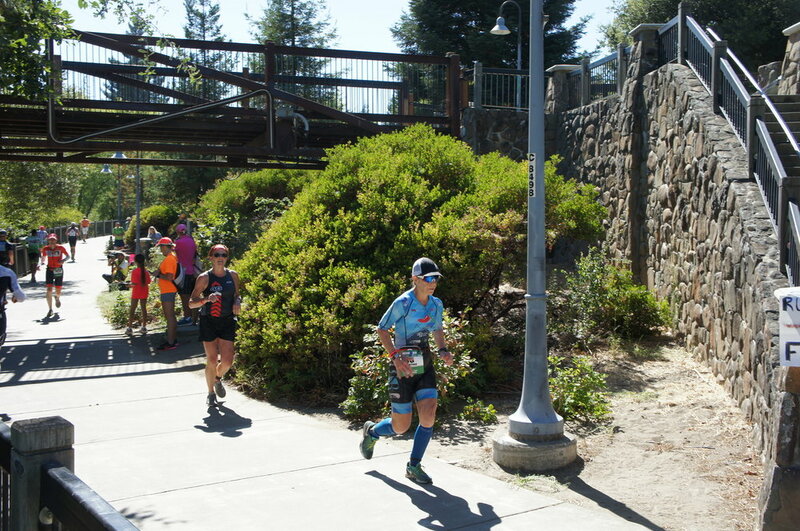 The race organizers had discouraged it and early on I had decided to take one of the shuttles from downtown SR to Lake Sonoma. The trick for spectators is that once you are on site, you are required to stay until the last cyclist leaves T1 around 9:30am. Ace & Sunshine wanted to be at the start - but didn't want to get stuck in traffic and miss portions of the bike. They had spent part of the day on Friday concocting a plan in secret and I had no idea if they would be there or not. I felt the butterflies as they stood on the curb and the bus pulled away. My bus ride was pretty chill. The white noise of the bus engine was actually soothing. And it was a relief to not have to navigate through traffic, pull up Google Maps or even have to talk! I popped on my headphones and listened to my IRONMIX. Sunshine had given me a card for each day before the race so I opened the last one marked SATURDAY and read it in the blue glow of my phone. Like the others, it was filled with U2 lyrics, favorite scripture verses and encouragement. I read my Wonder Woman card from Eliza and Renee. I breathed. I ate (a banana, a pop-tart and a Picky Bar). We arrived at the swim start at 4:45am and I hustled to start checking things off my list. Yes, I have a list. It's like a scavenger hunt! Written down in the order that I prefer: Find Lucinda. Drop my bags. Find the port-a-potty. Find a pump to borrow. Pump tires. Load bottles. Load bento box. Do a little dance. Drop bike gear bag. Warm up. Tri Glide. Sunscreen. Wetsuit. Drop morning clothes bag. Walk to swim start. Drop shoes. Swim warm-up. Get in the chute. Do another dance. Shuffle. Shuffle Shuffle. SWIM! I was amazed at how fast time flew from the moment I stepped off the bus to the time I stepped into the chute. I was as amazed at the way time slowed from the minute I stepped into swim corral til the moment my toes were in the water. I seeded myself close to the front of the 1:10 - 1:20 section and we started the long descent into the corral. It took nearly 20 minutes for me to get in the water. FOREVER! I kept looking up at the bridge high above and couldn't believe that I'd be biking over it. I kept looking down at the guy's feet next to me (seriously, they were huge). I kept looking out over the lake and thinking, Daaaaaaammmmm (because there was one). The first loop felt easy. I immediately fell into my breathing pattern and found my stroke. It was crowded, but I followed someone's feet and let the crowd pull me past buoy after buoy. It felt like swimming in the channel with the current at home. The steam that was rising from the swimmers was my biggest challenge. Usually I can sight at least a few buoys ahead, but with the surface fog, I could only spot one at a time. Each buoy was more crowded than the next and I got frog-kicked on one and had to readjust my goggles at another. I also got flustered at the turn into the marina but quickly recovered. This was the one buoy you have to keep on your left shoulder and I started veering into the marina too early. I had to readjust my line back to the turn buoy and for a moment felt frustrated at myself. But, I had one more chance to get it right on the second loop! And I did. The second loop felt fast. I had more space, could see better and found a great rhythm. 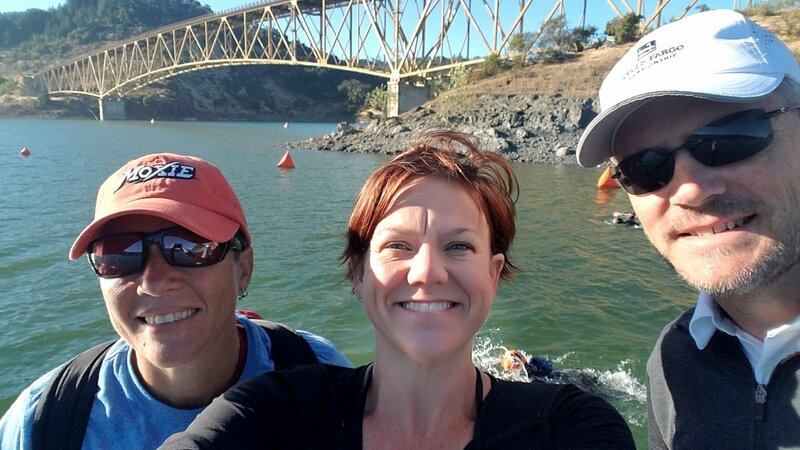 I loved swimming under the bridge and looking at the sun rising over the dam. I came out ready to bike in 1:12:10. The biggest challenge in the swim is actually the transition! It is a 10% grade for a quarter-mile to get up to the bike area. I left shoes somewhere along the carpeted path, so I picked them out, put them on, jogwalked 200 yards to the wetsuit strippers, sat down, took off the shoes, let them strip off the wetsuit, put the shoes back on and jogwalked another 200 yards to the bike chute. I predicted it would take me 15 minutes to do all that, grab my bike gear bag, take it to the changing tent, put on helmet, shoes, shades and headband, drop bike gear bag, run to bike and leave. I am thrilled to have done it eight minutes! 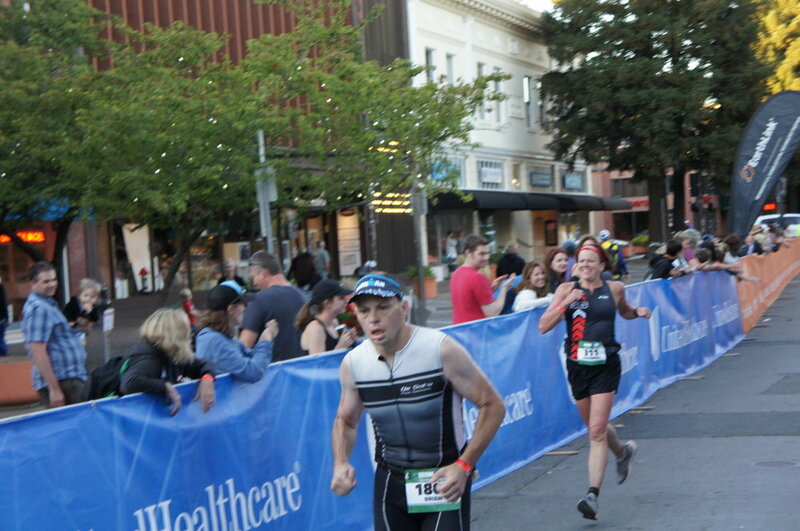 On Saturday, at mile 94 on the bike in Ironman Santa Rosa I got my mojo back. Not my athletic mojo, but my writing mojo. I realized about a month ago that have taken almost a year off from writing articles. Instagram makes it easy to be creative in short bursts without words. Plus, on that bike ride I realized two things have been holding me back: comparison and perfection. Part of my break is due to comparison. Why would I put anything out there when there are PLENTY of other talented coaches and bloggers out there already? What content can I put out there that is different or will make a difference? What can I say that hasn't already been said? Why would I write about my experience when other bloggers will share their race reports with better grammar and a bigger audience? 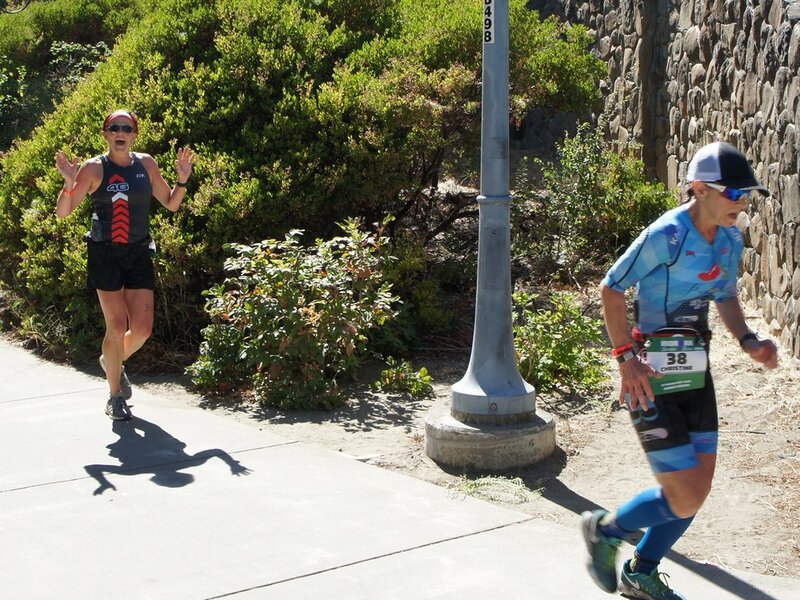 I actually met one of my favorite bloggers at Ironman Santa Rosa. It was as exciting for me as meeting a pro athlete! I recognized Amy Stone of amysaysso.com on the way out of T1 on Friday before the race. I've been reading her training and racing stories for about three years. I love getting her updates delivered to my inbox and always take the time to read them - and save my favorites. I stumbled upon her blog a few years ago and devoured her IMFrance race report. It helped me last year execute some of the details of my own race last June. The last thing I said to her: have a great race and keep writing! My inner voice said: take your own advice. Just like comparison steals my joy, perfection is the enemy of my progress. I want every article and thought to be whole and profound and complete and PERFECT before I hit publish. I fear the misspelled words and fret that my advice might be wrong. But, dude! I don't even have an editor. So, of course, there might be bad grammar and too many commas. And, this is my blog! So, I have the power to retract a statement if I learn otherwise. And so, I am going to write again. About training, races, athletes, advice and more. And yes, I'm sure these two things are holding me back in other areas and so I'll probably write about that, too. I hope you will join me for my next adventures. Ta Ta For Now. Don't miss out. Get my articles delivered to your inbox! Thanks! Can't wait to send you your first blog update. You can unsubscribe at any time. In 2012, I wrote that I did all this training and racing for the pink swim caps. Who knew that pink latex could bring such joy. This year I earned two pink caps for IMFrance and IMNC. It's always fun to look around in the swim crowd before a big race and spot all the women getting ready for this amazing adventure. Those pink caps make me feel strong and pretty. I really do triathlon for ALL things pink. Racing in pink makes me happy and faster. This year in France, I did the swim and the bike in red, white and blue, but for the run I actually changed clothes and ran in pink! It's wonder I don't have a pink bike. So. Much. Pink. I showed up to yesterday's session in head-to-toe pink. A lot has happened since I last wrote (in August!). Life and training and racing and fun and coaching and now the holidays. The great news is that it was a fabulous season. The bad news is that it simply got in the way of writing. And, that is really not a bad thing! I have been writing, but I actually blogged the old fashioned way: I wrote about my adventures in diary form in my calendar. Of course, I can't leave this format forever. I like posting pictures and telling stories right here in my own little corner of the interwebs. And, I love to look back and remember what stood out in the past 365 days. Like I did HERE and HERE. TO FIND MY EDGE: I did two IRONMANs this year. And one of those was in the Alps of France. I hope I never forget that feeling of flying into Nice and seeing those mountains in the distance. I was truly scared that I would not be able to climb them - after a 2.4 mile swim and before a 26.2-mile run. I thought I would fail. I was afraid, discouraged, vulnerable. I was awestruck: a feeling of reverential respect mixed with fear. I also hope I never forget the feeling of getting on my bike days later and facing that grueling ride. I hope I never forget the feeling of riding up a 17% grade hill for half a mile with people screaming for me to succeed and running alongside me. I hope I never forget the feeling of climbing at 9mph on a 8% grade for 90 minutes in the sunshiney switchbacks of the Alps-Maritime. I hope I never forget blazing down the slopes in the rain and thunder. I hope I remember the feeling of finishing that ride on the Promenade des Anglais - the noise, the people lining the streets, the emotion. It was more than pride or relief. It was joy and more awe. This time, a reverential respect mixed with wonder. I had seen the edge the lineof what I thought I could do - and I crossed it. These are insta updates from my personal site. Did I mention that I had a bad day? That I couldn't shake my mental rut? 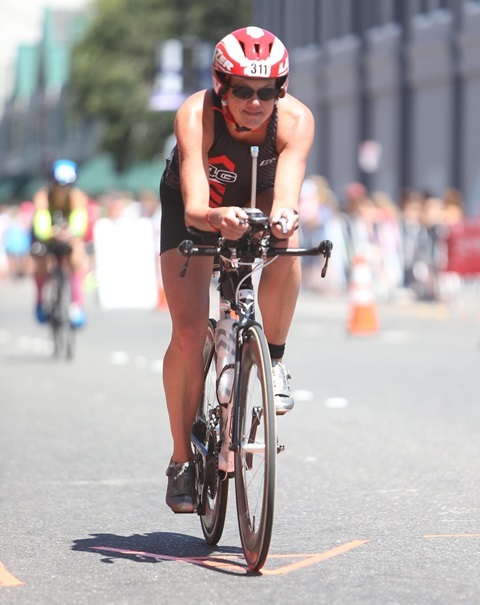 How I mentally had a come-apart and wanted to quit racing and training. And that I let it affect my race and the next many days of my life? So much so that I wanted to quit the job I love. And that I wanted to boycott Olympics and move out of the country? Oh, and did I mention that next week I'm supposed to give a presentation at a tri camp on MENTAL FITNESS?! Ha! I've actually been studying the ins and outs of mental toughness for the past few years. I have seven books on my shelf dedicated to the mental/emotional side of competition. I've bombarded a local sports psychologist with questions on how to get mentally fit. I've watched YouTube videos and listened to podcasts. I've practiced breathing and imagery and mantras and motivators. I love it all and use it all. I could say that your next best race is only a movie away. Or that everything you needed to know you learned from a movie. Like Dorothy in the Wizard of Oz you've had the power all along. You just need to know how to cultivate your skills and when to use them. For almost every iron distance triathlon, I've taken a movie-inspired PEZ along for the ride. I stash them in my Bento box. I've taken along Wonder Woman, Princess Leia, R2D2 and Elastigirl. Some face forward, some face me. Remarkably, I've never eaten the candy on the ride. BUT, I have been known to talk to them around mile 95. They're little reminders on how to keep my brain in the game. DORY - from FINDING NEMO & FINDING DORY Dory is OPTIMISM. She's talkative and fun and warm and friendly. She the Good Samaritan of the sea - likely to help you in your time of need. She has a sunny personality despite suffering from short-term memory loss. And maybe that positivity is a result of that memory loss. She'll sing to you: JUST KEEP SWIMMING, JUST KEEP SWIMMING. She's your mental pep talk. I need more DORY in my life. Sometimes I can be so hard on myself. In a race, I can really beat myself up for not doing what I "should" be doing. Especially on the run. At that recent race, I gave myself a pep talk from time to time. You can do this. This is just like France! You love this. Take in the moment! Enjoy this day. I imagined what I'd say to my athletes: BE YOUR OWN AWESOME! REJOICE! You are amazing. You are doing this! Keep up the good work. You are so strong. Before I talk about France and tell more funny stories about my bike rides this year, I need to address last week. Because last week was bad. There was a new G in town and it stood for GRUMPY. My state of mind was so bad that on Tuesday I quit triathlon. I quit coaching. I quit cycling. I quit swimming. I quit running. I quit the Olympics. I quit America. My funk started during the Lake Logan race and it took me daaaaaays to shake it. I was emotionally, physically and mentally stuck. Ace taught me years ago about a do-loop in computer programming. I got mentally stuck in a do-loop in the middle of the bike. I let the small things get to me. Like the fact that my wetsuit rubbed a hickey on my neck and I could feel it in the wind. And the fact that the tee shirt had a comma in the wrong place and said: Lake Logan Half. Half of what? Half a mile? Where's the 70.3? (I rarely even wear race tee shirts.) I got mad that I was invited to cheat (hey, we've got a nice draft pack! jump on in, the girl in my age-group said in a cheerful tone. I DON'T CHEAT, I yelled at her back as she whizzed past). Then, I felt guilty for yelling at her. My legs hurt. My back hurt. In transition, I found out that one of my athletes had crashed (bruised and battered body, broken bike frame) and worried about her for many miles. I was frustrated that it was hot. I was afraid I wouldn't finish. I felt fat. I fretted that I was letting others down. I was mad that I was so slow. Of course, being stuck in my brain on the course means that my results suffered. So after the race, all I focused on was my poor performance and how I didn't live up to my expectations. And then I had a bad week at work. And, we lost our interwebs (hashtagnoolympics) and one of the presidential candidates came to town. 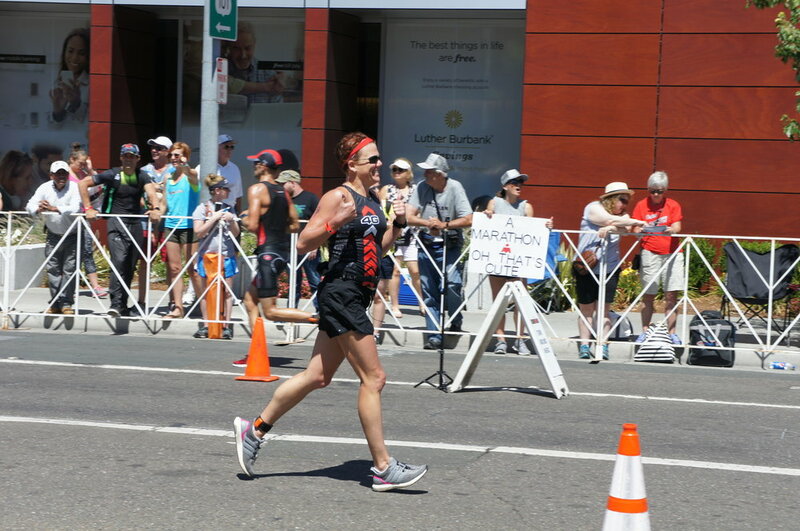 All of that cascaded into a bigger mental rut that turned into an emotional cavern into which I threw all my hopes and dreams and swimbikerun gear and my love and enthusiasm for the Olympics and my sense of humor about America. BLAH BLAH BLAH. WAH WAH WAH. WHINE WHINE WHINE. Instead of SHUT UP LEGS, I need a tee shirt - no wait, I won't wear it (maybe a coffee cup or tattoo) - that says SHUT UP BRAIN. Or maybe it needs to simply say: SHUT UP. Of course, as my hubby pointed out, I "learn more about myself on bad days than I do in the win". So, bear with me while I hash out what I did to unquit all that I quit last week. Today's ride included two new tubes, one new tire, the Yonder Store (and arcade) and a whole lotta hot. We started with a great group that included my regular biker chicks (Jen and Renee) + Johnny, Ty and Steve and we were joined for the first miles by Beth, Jess, Joe and Andrea! 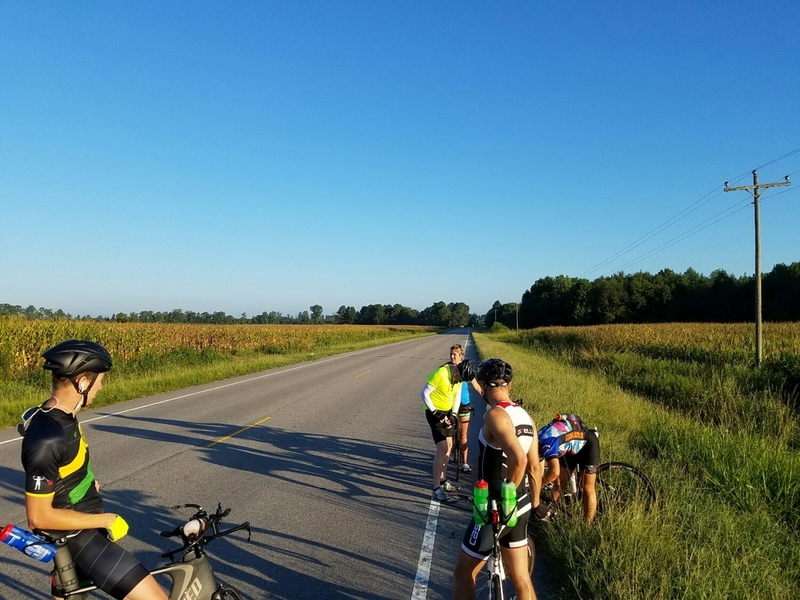 After the split, we did 75 miles through three counties in rural NC. The highlight of the day was the Yonder Store on HWY210 near Ivanhoe. The Yonder Store. As in: "Hey, Ma. I'm goin' to the store up yonder. You need anything?" "Yes, Junior. I need a grape Fanta, a moonpie, an extra long SlimJim and a zebra bra for church on Wednesday night." They had all that (and so much more), bu only two bottles of water in the fridge. When a fight almost broke out over who'd get the Deer Park and who was stuck with Club soda, the kind woman at the counter offered ice and water from the sink. She led us through a door that resembled an old freezer or bank vault door and into the arcade out back. It was an un-airconditioned rec room that was home to a pool table, arcade games, a 72-inch screen tv, a Half Court Basketball shooting game, a wall covered with bikini-clad models and a very large ice machine. Evidently it's hoppin' on the weekends. The low-light of the day was about an hour into our ride on HWY 421. We were cruising along at a good clip in a strong pace line: Renee, me, Johnny, Jen, Ty and Steve at the back. Out of nowhere, I heard a pop and a shout behind me and suddenly, Renee and I were alone. Jen had a front-tire flat. And miraculously pulled out of a skidding fall and avoided a pile-up of those behind her. We pulled over into knee-high snakey grass and she changed her tube in under two minutes but realized that not only was her tube slashed, but so was her tire. Fortunately, Johnny had an extra Gatorskin. Hay. Ya'll need to get out the road! Don't ya'll know that's DISRESPECTFUL? You need to get out the road! They drove off, leaving us all with our mouths gaping open. Jen gave a half-hearted thanks for checking on us since I have a flat and nearly DIED! I waved and wryly called out: Thanks, Ya'll! Hurry on up for church. After four hours on the bike and a short run, we had a picnic of Modelo, Watermelon and Cheetos in the shade of Malpass Corner Elementary school and rehashed the incident. Were we disrespectful? Did she really mean disrespectful? Or was there a nicer word she wanted to use? Were we really impolite, rude or discourteous. Wasn't she? Did we obey the law? In North Carolina, cyclists share the road and the same responsibilities as vehicles. In the case of an accident, a motorist would pull safely to the side of the road and fix the problem and wait for help. In the case of an accident, passing vehicles would stop to help, slowly move on or rubberneck. We pulled over into the shoulder (notice I didn't say: bike lane) to change the flat. S.R. and I were on the left side of that white line. He was acting as a safety beacon, directing traffic around the incident. I admit - I was the rubbernecker taking the picture. None of that is disrespectful. The fact is that cyclists and motorists need to know the law. You can read more about NC Law HERE. And HERE. And HERE. Flat No. 2. Lots of THAT'S WHAT SHE SAID jokes.